She expects the best for her special day and gets it. She has a keen eye for beauty and quality, and she demands professional service. She seeks both efficiency and bespoke designs exquisitely crafted for her wedding. Kenzi is on her side, adorning her with gorgeous and unique mehndi designs in a deep rich color. She is devoted to making the bride's most important day beautifully perfect. Book a 30-minute appointment to talk with me about your bridal mehndi, look at designs together to get an idea of what is available and which of the packages below would best suit your needs. Most bridal mehndi is custom work so the consultation is an important part of the process of co-creating your design. You will also get a sample henna design to judge the quality of the work and the nice dark stain. Please note that I do not do house calls for this type of appointment. Online booking makes it easy to lock down the date you want; you can also book your consultation appointment or pay your deposit. This package is for the bride's mehndi (2.5-3 hours' work*) and consists of full palms and up the wrist 2-3 inches, mehndi strip on the tops of the hands and mehndi strip up the feet and ankles. When we talk at the consult we can discuss the amount of coverage and details you want and see if this package will meet your needs. You can see sample designs of this package here. If you want henna for your henna party please book that separately here. This package is for the bride's mehndi (3.5-4 hours' work*) and consists of full palms and tops of hands going up the wrists 3-5 inches and partial coverage of feet going up the ankles. This is our most requested package. When we talk at the consult we can discuss the amount of coverage and details you want and see if this package will meet your needs. This package is for the bride's mehndi (4.5-5 hours' work*) and consists of full coverage of hands and forearms and full coverage of feet, and 3-6 inches up the legs. A beautiful traditional pampering! When we talk at the consult we can discuss the amount of coverage and details you want and see if this package will meet your needs. Consider getting your bridal mehndi done the day before your mehndi party so that you can just relax on the day of the party without worrying about smudging. 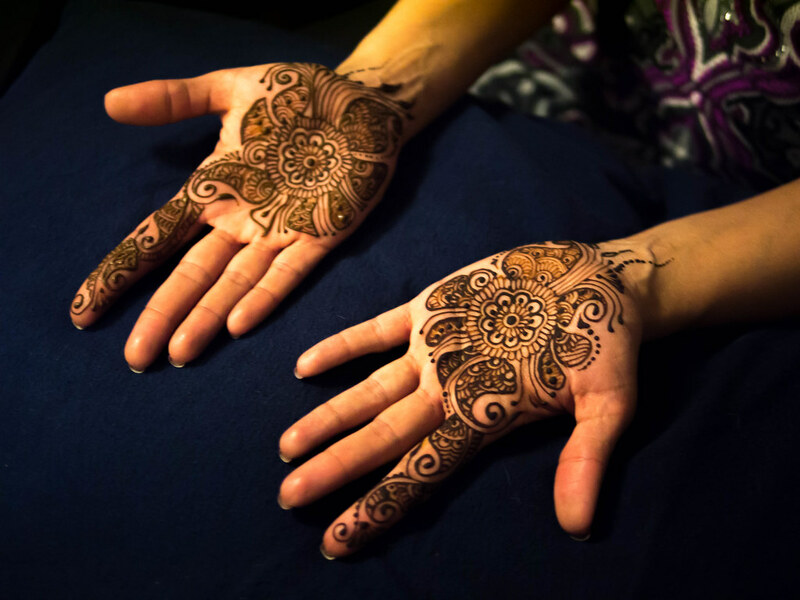 The above package prices include all henna supplies, application and aftercare and are for the bride only. If you'd like artists to do henna for your party you can book that separately at a rate of $125/hour with a two-hour minimum. Travel costs may apply to certain areas of the outer boroughs of NYC as well as the rest of the tri-state area; please ask if your area is exempt. The 30% deposit you pay when booking guarantees the date and time you desire. The deposit is refundable if you cancel one week or more in advance; if you reschedule the event for a date within three months of the original date, the deposit is transferable. Swarovski crystal and/or white or gold mehndi is available the day of your wedding; the rate is $125/hour with a one hour minimum. * This time estimate does not include waiting time due to delays by client. Any waiting time will be charged in 15-minute increments at $125/hour with a 15-minute grace period. Our henna paste is 100% organic and mixed personally for every client using the freshest and finest organic ingredients. Our organic henna powder is flown in from India's famous Rajasthani henna farms, and then mixed with the best organic essential oils, plus organic coconut palm sugar and world-famous New York City tap water. Organic cajeput (a tea tree cousin), geranium and cardamon essential oils are mixed into the paste to add a delightful olfactory dimension to your henna experience. Not a day goes by where a client doesn't exclaim how delicious my henna smells. You will never have to wonder what is going onto your skin; you can just sit back and let us take the very best care of you.